Treasury Secretary Steven Mnuchin said that unlike Obama's 2013 Iran blockade, it would be harder for countries to get waivers on Iran oil sanctions as the US is already working on disconnecting Iran from the SWIFT network and dismissed concerns that oil prices could rise, saying the market had already factored in the output losses. Speaking in an interview with Reuters in Jerusalem on Sunday at the start of a Middle East trip, Mnuchin said countries would have to reduce their purchases of Iranian oil by more than the roughly 20% level they did from 2013 to 2015 to get waivers. "I would expect that if we do give waivers it will be significantly larger reductions," said the US Treasury Secretary. To achieve the US goal of further isolating Iran from the global financial community, Mnuchin said that the U.S. Treasury was already in negotiations with the Belgian-based financial messaging service SWIFT which intermediates the bulk of the world’s cross-border dollar-denominated transactions, on disconnecting Iran from the network. Washington has been pressuring SWIFT to cut Iran from the system as it did in 2012 before the nuclear deal. Validating European concerns that the US can and will weaponize the dollar at will and use the reserve currency as a global bargaining chip, Mnuchin's threats confirmed that although the United States does not hold a majority on SWIFT’s board of directors, the Trump administration could impose penalties on SWIFT unless it disconnects from Iran, pressuring it to comply with US demands. "I can assure you our objective is to make sure that sanctioned transactions do not occur whether it’s through SWIFT or any other mechanism,” he said, “Our focus is to make sure that the sanctions are enforced." While Mnuchin declined to give details of the talks with SWIFT executives, he said that the Treasury Department would identify “as quickly as possible” banks that would be allowed to process transactions for humanitarian funding to Iran, and by implication identifying all the banks that would be isolated. "We want to get to the right outcome, which is cutting off transactions,” he said, declining to comment on which banks would be selected. In August, Germany’s Foreign Minister Heiko Maas called in August for a system that was an alternative to SWIFT and would allow "financial independence" from Washington, that would possibly keep the nuclear agreement with Iran alive. While Iran believes that it can ward off severe economic damages from the U.S. sanctions for the remainder of Trump’s term, Mnuchin predicted a significant impact on its economy as major companies exit the Iranian market for fear of U.S. reprisals. “We have already begun to see the impact and my expectation is we will see a significantly larger impact once the sanctions go into place,” he said, “The economic squeeze will be very big over the next two years." 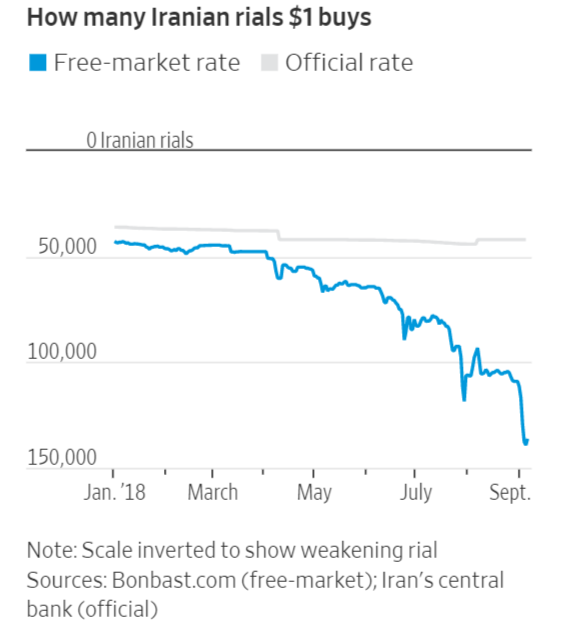 In anticipation of the enactment of US sanctions, the Iranian currency has tumbled in the black market as the nation's economy has slowed down substantially, provoking several violent protests in recent weeks. Iran's top leadership has lashed out at Washington for escalating its economic blockade of the country. In a speech in early September, Iran's supreme leader Ayatollah Ali Khamenei, condemned the US sanctions as economic "sabotage" while making specific mention of diaper shortage. "Imagine that in Tehran or other major cities, baby diapers suddenly become scarce. This is happening, this is real, this is not make-believe. Baby diapers!" Khamenei said, according to the official state transcript. "This makes people angry. On the other side, the enemy wants people to be angry with the government and system. This is one of their ways." Meanwhile, the US is also juggling with potential blowback from Iran sanctions, which have manifest themselves in sharply higher oil prices. Mnuchin, however, dismissed fears of even higher prices, saying that "oil prices have already gone up, so my expectation is that the oil market has anticipated what’s going on in the reductions. I believe the information is already reflected in the price of oil." Not everyone is convinced. According to analysts, Iran’s oil exports could fall by as much as two-thirds due to the sanctions, straining oil markets. As RBC notes, the White House’s strategy to remove large volumes of Iranian oil from the market while shielding US consumers from higher prices at the pump hinges on the ramp-up ability of other producers, mainly Saudi Arabia. 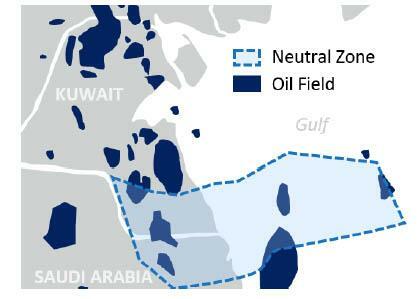 While the Saudis insist that they have close to 2 million barrels of additional supply that can be brought on, RBC contends that the country is likely approaching the upper limits of what it can easily bring on and that any significant surge higher will require bringing back the 500 kb/d Partitioned Neutral Zone (PNZ) with Kuwait. US officials have been insisting that a PNZ restart will occur before year-end, but a flurry of press reports this week suggest that optimism is likely misplaced. The role of Chevron remains a major sticking point, but key foreign policy differences (including Kuwait’s ties to Turkey and desire to adopt a more neutral stance in the Qatar and Iran disputes) have also stymied efforts to reach an accord. There is of course the concern that an enraged Saudi Crown Prince Mohammed bin Salman will respond to global criticism over the Jamal Khashoggi’s killing by limiting Saudi exports, which may explain why Trump has been especially careful in escalating the war of words with Riyadh, as even the rumor of a Saudi production curb - while an act of Mutually Assured Destruction which would result in a loss in Saudi market share and the death of any hopes for an Aramco IPO - would lead to a surge in oil prices at a very politically sensitive time for the US.